Lest we forget, vaccines are one of the greatest medical inventions of all time. Without them, we would see cemeteries filled with children who would have died before they were even five years old. In fact, the best evidence we have tells us that vaccines prevented 200 million cases of diseases in the USA alone in the five decades since 1963. A recent study, published in AIMS Public Health, estimates that around 200 million cases of polio, mumps, rubella, measles, adenovirus, hepatitis A and rabies have been prevented in the U.S. from 1963 through 2015 as a result of widespread vaccination. The study, authored by Leonard Hayflick and S. Jay Olshansky, two leading experts on public health and infectious diseases, also discloses that about 450,000 deaths have been avoided in the U.S during this period, although other studies put that estimate of lives saved at a much higher number. Dr. Hayflick discovered the human cell strain, WI-38, in 1962 which was critical to the safe manufacturing of vaccines, which became widespread in 1963. According to the article, the vaccines produced from the WI-38 cell line prevented almost 4.5 billion occurrences of the diseases, and stopped them from returning to infect us. Dr. Hayflick developed the foundation that allowed the world to have relative safe and very effective tools to prevent infectious diseases. Prior to the development of WI-38, anti-virus vaccines were grown in monkey cells, which had some issues that made many question their safety, although most of the concern appeared to be overblown. However, once the WI-38 was available, it became easier to develop and produce vaccines for many viruses. Once again, let’s talk about Mr. Andy Wakefield, one of the greatest frauds in medicine over the last 100 years. I’m not exaggerating, he really is considered that. Lately we’ve had to put up with his anti-vaccine lunacy with his fraudumentary, Vaxxed, which is out in theaters even now. In the “documentary” (scare quotes intentional), Wakefield rehashes his same old misinformation, ignorance, and utter nonsense. I do try to ignore him, like I ignore that Australian expatriate, Ken Ham, who is wasting American taxpayer money to build a temple to that biblical myth that has all of the scientific basis of, well Wakefield’s claims. But sometimes Wakefield just keeps coming, without muzzling his mouth. The latest is the photo below that’s hitting the interwebs. The picture includes a sad looking dog, possibly a German Shepherd (but I am not a dog expert – I’m a cat person), sitting next to Mr. Wakefield. I don’t think that’s what the dog was thinking. Now he’s trying to do the same for our pets? Dogs are protected from some serious diseases because of vaccines and other preventative medicines. Rabies. Distemper. Parvovirus. Bordetella. Hepatitis. Lyme disease. And many more. Not only are these diseases dangerous to our dogs, they can be passed to us. Rabies is a horrible disease, and if a dog contracts it, they may have to be euthanized. And if that rabid dog bites a child, they have to endure a very painful series of vaccines. No, rabies cannot be prevented by a gluten free, organic diet for your dog. They are bitten by some rabid animal because, well, dogs are curious, and can be bitten by a bat, raccoon, wild cat, and who knows what else – and once bitten, the disease transfers to them. And, we can only conclude that Wakefield also fails on the “how he treats dogs” category. If dogs could talk, I wonder what the dog comments on Andrew Wakefield would be. 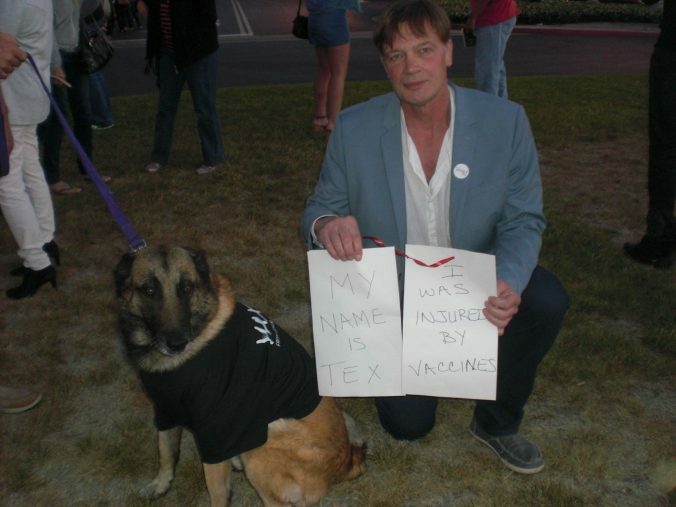 Here’s a poll of what I believe the dog thinks about Andrew Wakefield. Choose your favorite. Or reply in the comments with a better one. I love that!